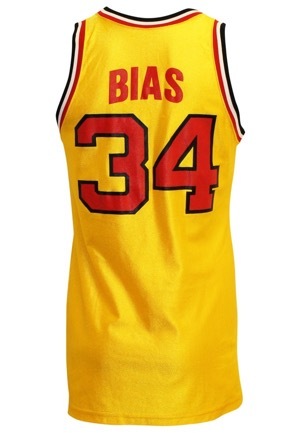 Len Bias was considered one of the most dynamic players in the nation at the University of Maryland. By his senior year, scouts from the various National Basketball Association teams viewed Bias as the most complete forward in the Class of 1986. Bias was drafted by the Boston Celtics with the second overall pick and tragically died two days later from cardiac arrhythmia induced by a cocaine overdose. He is considered by some sportswriters to be the greatest player not to play at the professional level. 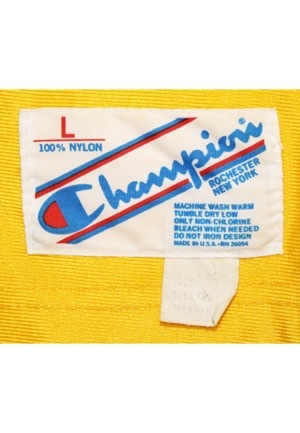 On the front left tail is the Champion manufacturer’s tag size “L” with washing instructions. Attached is a flag tag that reads “3” EXTRA LENGTH”. Across the chest reads “MARYLAND”. Adjacent below and on the back is the player number “34”. These are painted on in red on black. Across the back is the player name “BIAS” painted in red. This jersey is properly tagged, was presented to us as game-used and in our opinion shows appropriate use. 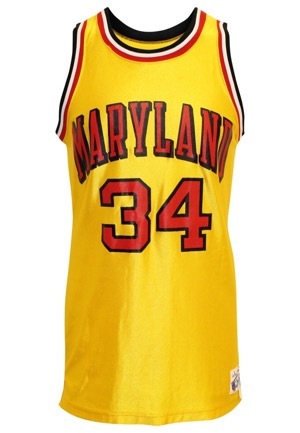 Directly sourced from the Maryland Athletic Department.